Eunan McGlinchey on his way to victory in the British Junior Supersport class at Oulton Park on the team 109 Kawasaki. Picture: James McCann. Young Aghadowey prospect Eunan McGlinchey is on the brink of being crowned a British champion in his first full season in the Dickies Junior Supersport Championship next month. 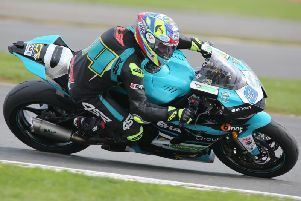 The 20-year-old won the opening race at Oulton Park in Cheshire last weekend and finished third in race two to open a lead of 43 points at the top with one round remaining at Brands Hatch (October 12-14). Eunan McGlinchey with Team 109 members Martin McGlinchey, Paul Tobin, Dave Hurley, Shannon Grant, Maired Hurley and Donna McGlinchey. Picture: James McCann. A top seven finish will be enough to secure the title for the highly rated Northern Ireland rider, who has made huge strides this season on the Team 109 Kawasaki. He qualified in seventh place on row three for the first race at Oulton but quickly made his way through the pack. However, race leader and McGlinchey’s nearest title rival, Brian Hart, had a lead of almost four seconds at the front. Undeterred, McGlinchey began to eat in Hart’s advantage and was reducing the deficit by around one second per lap. He timed his move to perfection on the penultimate lap to lead the race for the first time and kept his composure on the final lap to fend off Hart, snatching a stunning victory by only 0.072 seconds. The result gave McGlinchey an opportunity to seal the British crown in race two on Sunday with a victory. He started from pole and became embroiled in a battle with Hart and Elliott Pinson as they broke clear of the field. On the final lap, McGlinchey made his move for the lead at the last corner, but a slight error cost him two places on the exit and he crossed the line in third behind Hart and eventual winner Pinson. For now, the champagne is merely on ice, with McGlinchey poised to toast a deserved British title triumph in October. He said: “Coming away it was a good weekend, free practice started off brilliantly, finishing the session at top of the standings. “Into qualifying it was a patchy track in terms of the conditions, so I didn’t push too hard knowing I could get off the line and make up the positions. “In the opening race I had to claw back over three seconds of a gap to be able to challenge for the win, but the bike worked perfect in the tough conditions and I was able to take the win,” McGlinchey added. “Race two was a tight one between myself, Hart and Pinson, and as it has done many times before it all came down to the last corner on the last lap. Team 109 team manager, Paul Tobin, hailed McGlinchey’s composure as he took a huge step towards the Junior Supersport title. “Eunan rode an incredible race one on Saturday, coming from seventh on the grid,” he said. “To close a three-second gap to the leader and then pass the more experienced Hart on the KTM UK-backed machine to win was superb. He rode a shrewd race two and did have a look at Pinson for the win at lodge corner on the last lap, but took a sensible podium for more championship points.